Still from 12th Taishin Arts Award Grand Prize winner Su Yu-hsien’s Hua-Shan-Qiang (2013), video, 21 min 8 sec. Courtesy Taishin Arts Award. Artist Su Yu-hsien has been awarded the grand prize of the 12th Taishin Arts Award, it was announced at an award ceremony in Taipei on Jun 21. Sponsored annually by the Taishin Financial Holdings Co., the award confers NTD 1,500,000 to the grand prize winner and NTD 500,000 to four other short listed artists. This year’s award featured a revamped system whereby the artists were judged in a single cross-disciplinary category. Previously the awards had been divided into visual and performing arts categories, as well as a special jury’s award. Born in 1982, Su Yu-hsien works across all media, but is perhaps best known for videos combining a flat, documentary aesthetic with ironic, conceptual distance. 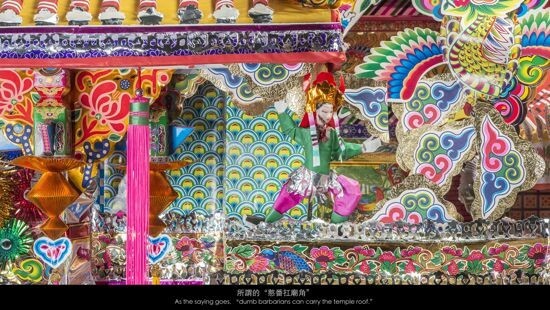 He was awarded the grand prize for his work Hua-Shan-Qiang (2013), which creates a wry narrative out of elements from Taiwanese funerary culture, in which a paper “house” and objects such as televisions, karaoke machines, cars and servants are made to welcome the spirit of the deceased to the afterlife, and then burned. Another innovation of this year’s award was a tie-in with TEDxTaipei, with each of the five short-listed artists presenting talks at the award ceremony. These talks will be accessible online in Chinese and English through the TED website. The other short-listed artists and projects were: Kao Jun-honn, for The Ruin Image Crystal Project: 10 Scenes; Li Ming-chen (StyleLab), for Dear All – 2013 Young Stars New Vision-Theater II; MeimageDance, for My Dear; and M.O.V.E. Theatre, for Dear John. All short-listed works are currently on view in the “12th Taishin Arts Award Exhibition” at the Museum of National Taipei University of Education (MoNTUE) in Taipei, through Jul 13.